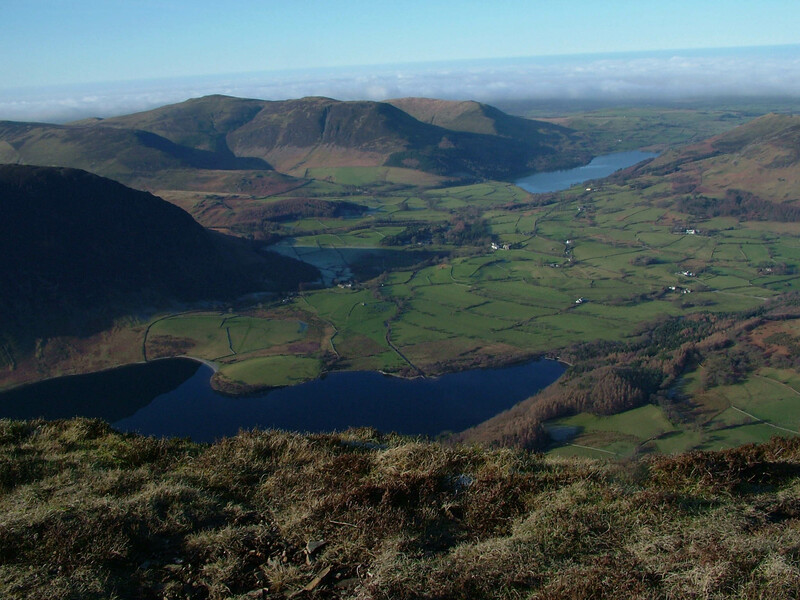 Loweswater covers a large area of some 1760 hectares (4360 acres). On the eastern side, it borders the west side of Crummock Water and the bank of the River Cocker running north. It then runs to the west just north of Thackthwaite, bordering the civil parish of Blindbothel on the north side, following Meregill Beck to the summit of Fellbarrow before encircling Loweswater Lake via Sourfoot Fell. Mockerkin Tarn is at the extreme west of the Civil Parish. The boundary runs along Meregill Beck and incorporates a large area of fell including, Burnbank Fell, Blake Fell, Great Bourne, Gale Fell, Starling Dodd, Little Dodd, Red Pike, and Bleaberry Tarn before descending to Crummock Water. For an accurate map of the Loweswater Parish boundary, see here. According to the 2001 census, there were 92 households across the parish with a total population of 209. The lake of Loweswater is the most northerly and one of the smallest in the Lake District, being one mile in length and half a mile wide. Most of the Civil Parish lies within the National Park, apart from Mockerkin in the west, and is five miles south west of Cockermouth. Mockerkin Tarn lies on the western boundary of the Parish. The entry on the Wikipedia website describes the Tarn as being ”… the traditional site of the palace of Morken, a Celtic King. It occupies a shallow basin surrounded by lush pasture, with a small stream entering from the east beside a wooded area. The gentle outflow eventually joins the River Marron. In summer there is a wonderful display of white and yellow water lilies, which stretch in broad bands across the south western corner of the tarn, which contains eel, pike and perch”. Major Iredale lived at Mockerkin Hall and was Master of the Melbreak foxhounds for many years. Loweswater is a scattered village. The Church of St Bartholomew’s and the Kirkstile Inn are close by each other, both with stunning views. The Church was renovated and made much larger in 1884. This was due to some lead mines being opened in the area and it was thought that the population would increase. Unfortunately the mines did not produce enough lead and the venture failed. The Kirkstile Inn was originally a working farm and its origins are in the 1600s. As an Inn, it used to be known as The Hare and Hounds. The Inn always had a close association with the Melbreak Hunt. It was the venue for the opening meet in October and on New Year’s Day. The Hunt was always very popular with the farmers. The Kirkstile Inn is now very much patronised by climbers, walkers and tourists. It used to have its own brewery, but this closed in 2009 when the owners took over a brewery in Hawkshead. Scale Hill Hotel in Brackenthwaite is just across the bridge over the River Cocker, and, in fact, situated within Buttermere Civil Parish. It has closer ties with Loweswater than with Buttermere, and began as a farm before it developed into an Inn. With the birth of tourism in the Lakes in the late 1700s, Scalehill soon became a popular place for tourists travelling by horse and carriage to stop on their tour from Keswick to Buttermere and Loweswater, before continuing through Lorton Vale to Lorton village. It was developed over time into a hotel. It was always very popular with Americans and people who sought quiet and solitude. In more recent times, the author Arthur Ransome was a regular visitor, as were Joyce Grenfell the entertainer and her husband. The hotel kept boats for the use of guests on Crummock. The hotel was converted into several separate holiday cottages in c.1990. The Loweswater and Brackenthwaite Agricultural Society was established in 1870, its first Secretary being William Coates Hope of Cornhow. Traditionally, it was one of the most popular agricultural shows in the district. It used to be held on the third Thursday of September and for many years was held at Godferhead. From 1888, records show that the school children were allowed to take the day off from school so they could attend the show with their parents. In the earlier part of the twentieth century, people came from Keswick by pony and trap and many stopped on their return at the Scalehill Hotel for tea, before continuing on their homeward journey. There were no shows during the two World Wars. James Coulthard (1852-1948) is recorded in Bulmers Directory of 1901 as running the Post Office in Gillerthwaite. It was located in the living room in his home. He was also gardener and coach driver at Foulsyke for the Robinson family. When telephone wires came to the area, the public telephone was in a kiosk in the house, for some time being the only one in Loweswater. After he retired, one of Coulthard’s daughters, Ada, continued running the post office for a number of years until the late 1940s. The Post Office then moved to Palace How while the Cholmley family were there, and it then moved to Thrush Bank. It closed in the 1950s, Loweswater people then being obliged to go to Lorton Post Office. The Rev’d Geoffrey Howard White (1910-1990) was vicar at Loweswater for 28 years. He was quite an eccentric character which everyone liked. He was born and lived in Manchester before the family moved to Marple in the countryside on the borders of Cheshire and Derbyshire. From the age of 16 until he was 24, he was in the Monastery of The Society of the Sacred Mission at Kelham. He was ordained in Leicester Cathedral in 1934. At the beginning of the Second World War, Geoffrey became an Army chaplain with the 4th Buffs. Within months, he was captured in the retreat to Dunkirk. He spent the next five years as a Prisoner of War in four different camps. After the War was over, he was briefly sent as Chaplain to Carlisle Castle, where, he arrived in a very poor state of health and mind. However, he was discharged from the Army as unfit and was offered the living at Loweswater by the Bishop of Carlisle. On the 31 December 1945, Geoffrey White was inducted as Vicar of Loweswater. He moved into the Vicarage with the minimum of furniture – camp bed with mattress and bedding, one chair, a little food and a primus stove for cooking as there was no mains electricity in the parish. He slept badly the first night in the emtpy chilly Vicarage. Early next morning, on New Year’s Day, he took a walk around the garden admiring the views of the mountains when he suddenly noticed his front gate which he had shut night before to keep the sheep out was missing and also the gate at the top of the garden. A couple of hours later the milkman and local farmer Joe Hope called. He explained to Geoffrey that this was a way of welcoming in the New Year. The gates were found in the middle of a field a quarter of a mile away. In the early days of 1946, Geoffrey found his physical weakness, blinding headaches and stomach troubles, a legacy from prolonged bouts of dysentery in Germany, quite a handicap. Wentworth Bird Robinson was his Churchwarden at the time. He was always known as Wenty Robinson. He and his wife Madeleine lived at Turner How before moving to Foulsyke after his brother’s death. They and their sons Edmund and Daniel and their daughter Joan became close friends and played a large part in Geoffrey’s life. Geoffrey was determined to get to know everyone and to play as active a part as he could in the social life of the parish. He quickly discovered the “centre” of the parish, as far as entertainment went was, was an old Army (Nissen) hut which was in a hollow on the hill above the vicarage. Whist-drives, dances, concerts and all kinds of meetings took place there, and films where shown too. Geoffrey was particularly interested in farming, having worked on a farm in his school holidays. One day he noticed the field above the vicarage was being ploughed, and went over to ask Gordon Stagg, the farmer, if he would let him have a go at ploughing. Despite having driven a horse and cart in the past, he found managing the plough stilts was quite different, and difficult. When he looked back, the furrow was very crooked. A few hours later, he found an entry form for the World Ploughing Championships had been pushed through his door. Six weeks after Geoffrey’s arrival, the WI called a meeting in the Nissen hut with a view to forming a Dramatic Society. Twelve people turned up and the drama group was formed. Geoffrey acted in and produced plays for this group, first under the auspices of the WI, and then as an independent entity until 1971. In the early days, stage lighting consisted of candles placed in polished biscuit tins. Later on, car batteries borrowed from a Cockermouth garage were used. After that, a tractor produced electric current. Once electricity finally came to the Loweswater in 1961, the group equipped themselves with a lighting system, which Harry Spencer, a local farmer, looked after. As Geoffrey recovered his health, he took up an old hobby, fishing. He fished for salmon in the River Cocker, trout from Crummock Water as well as the famous deepwater char. Potted char had been a Loweswater delicacy in Victorian days. In the early 1960s, Wenty Robinson died. His widow Madeleine, and daughter Joan decided to sell Foulsyke. They put the property on the market, and Oliver Symes, a Manchester businessman, purchased the property. He and Geoffrey got on well, and Symes made arrangements for purchasing and providing a Parish Bus. The bus transformed parish life and it was used for many purposes, including transport for carol singers at Christmas visiting the many homes dispersed round the parish. “My mother, Constance Turner (nee Haythornthwaite – a Cumbrian family who came from Rowrah), evacuated from Oxford during the War, in about 1940. We moved initially to Godferhead farmhouse, where we stayed for a number of months. I remember being very small and walking up the stairs with a candle to our bedroom where there was a small rag carpet on the floor by the bed and the bed was heated by a ceramic flask hotwater bottle. We used to call them tanks and had to move them around the bed with our toes to get the bed warm. One day I was in the farm yard and, not knowing what I was doing, unlatched the door where the Rawlings kept their bull. Luckily he did not realise the door was open! The school at Loweswater was built at the end of the 1830s, and closed in 1984. There was one class room with a kitchen and cloakroom. One pupil who was at the school during the 1940s remembers the Headmistress, Mrs Alice James, living in the flat above the school. During the Second World War, the evacuee children staying in the area came with a teacher called Miss Rutherford and joined the school. There was not much play equipment at this time apart from bean bags, hoops and skipping ropes. For P.E. the children would walk, skip, and run around the play area. A bean bag was hung from the lower branch of a tree and when they reached it, they had to jump up and touch it. Other activities in school breaks would be hopscotch, marbles and conkers in the autumn. After the school closed in 1984, the premises became the new Village Hall. During World War Two, members of the Home Guard in Loweswater were responsible for keeping a watch on Crummock Water. It was thought that a sea plane could easily land on it. Low Park Farm is a very old farm, originally dating back to the 1500s. This farm, and other farms close by situated on the North West side of Crummock Water, were formerly owned by Workington Water Board. In 1932/4 the farmers were stopped from farming for fear of contamination to the lake. The farming families left, the family from Low Park emigrating to Australia. However, the land was subsequently let out to other farmers who were allowed to keep stock on it, and the various farm houses in the area were let to non-farming people, Workington Water Board refusing to sell any properties on the basis that it would require an Act of Parliament to enable them to do so. In the mid 1970s, the Manchester Water Board took over Workington Water Board and put the properties up for sale. The National Trust is now a significant landowner in Loweswater. The Warden’s House is next to Watergate Farm at the southern end of the lake.